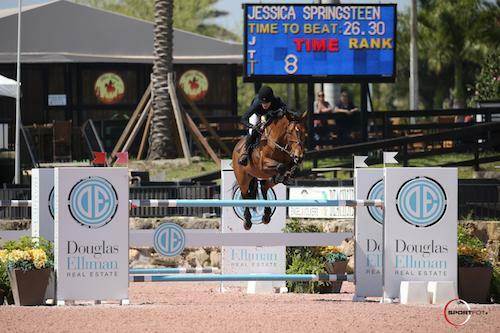 Wellington, FL – March 22, 2017 – Jessica Springsteen (USA) and Davendy S topped the $35,000 Douglas Elliman 1.45m CSI 5* on March 22 at the Winter Equestrian Festival (WEF) in Wellington, FL. The pair outraced Amanda Derbyshire (GBR) and Lady Maria BH, who finished in second place, and Kristen Vanderveen (USA) and Bull Run’s Faustino, who settled for third place. The eleventh week of WEF features CSI 5*/2* competition at the Palm Beach International Equestrian Center (PBIEC) on March 22-26, 2017. The feature ‘Saturday Night Lights’ event is the $500,000 Rolex Grand Prix CSI 5* on Saturday, March 25, at 7:30 p.m., preceded by the $130,000 Suncast® 1.50m Championship Jumper Classic Final at 6:30 p.m. On Sunday, March 26, is the $50,000 Engel & Völkers Grand Prix CSI 2*, while the George Morris Excellence in Equitation Championships will host the nation’s best junior riders on Friday, March 24, at 4:30 p.m. in the Van Kampen Covered Arena at Equestrian Village at PBIEC. The week’s highlights can be viewed on live stream HERE. The 12-week WEF circuit continues through April 2, 2017, awarding over $9 million in prize money. 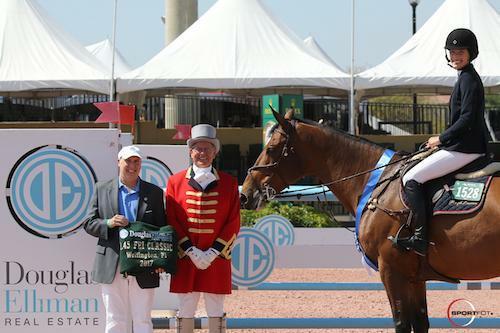 Guilherme Jorge (BRA) is the course designer in the International Arena at PBIEC for WEF 11. Jorge set the track filled with related distances for 54 starters over the 1.45m course, held in a two-phase competition, and saw 22 double clear rounds. With the exception of Springsteen, the top six competitors finished the second phase within one second of each other. Springsteen and Stone Hill Farm’s Davendy S sprinted around the second phase of the course, crossing the timers in 24.609 seconds, over a second and a half ahead of Derbyshire and Lady Maria BH, who left a stride out in the final line to take over the leading time just four trips earlier in 26.302 seconds. Vanderveen and Bull Run’s Faustino recorded a third-place time of 26.532 seconds. Out of her current mounts, Springsteen has owned Davendy S for the longest. Over their three years together, the pair has gained a reputation for being strong contenders in the speed classes and won the same class during week seven of the 2017 winter circuit. Norman of Douglas Elliman Real Estate and ringmaster Steve Rector. The International Arena had three other classes on Wednesday. The first class of the day, the $8,000 Illustrated Properties 1.40m CSI 2*, found a winner in Lucy Davis (USA) and Old Oak Farm’s Boucherom. The $1,000 Illustrated Properties 1.40m CSI 5* followed with Ben Maher (GBR) taking the top honors aboard It’s Real Love Vd Smis Z, owned by Poden Farms. Darragh Kenny (IRL) and Important de Muze, an entry owned by Kerry Anne LLC, concluded the day with a win in the $6,000 Illustrated Properties 1.40m. Week eleven of the Winter Equestrian Festival continues in the International Arena on Thursday featuring the $35,000 Ruby et Violette WEF Challenge Cup Round 11. The Antares High Performance Working Hunters will determine championship and reserve honors in the E.R. Mische Grand Hunter Arena. For full results, please visit www.PBIEC.com.